Several months ago, we explored the anatomy and physiology of the pancreas in terms of its role in the digestive process. But the pancreas is one of a handful of organs in the body that functions in two distinct modes. It is not only an exocrine digestive organ, but it also functions as part of the endocrine system and, to a significant degree, controls the metabolism of sugar in the body and its use as a source of energy for every single cell and organ in the body. In this newsletter, we examine the endocrine functions of the pancreas. As an endocrine organ, the pancreas produces two sugar-regulating hormones: insulin and glucagon. After reviewing the functions of insulin and glucagon and the four cell types that comprise the endocrine pancreas, we'll examine in detail the main disease associated with the pancreas, diabetes mellitus. The pancreas functions in two modes. As mentioned above, the pancreas functions in two distinctly different modes. It is both an exocrine digestive organ that secretes digestive juices and enzymes into the duct of Wirsung that runs down the middle of the pancreas and empties into the duodenum at the head of the pancreas. But the pancreas is also an endocrine organ, producing insulin, glucagon, and somatostatin that flow directly into the bloodstream, eventually reaching virtually every cell in the body. We explored the anatomy and physiology of the pancreas in some detail in our newsletter focused on that topic, but a quick review would be appropriate before discussing the gland's endocrine function. Physically, the pancreas is located in the upper abdominal cavity, towards the back -- in the C curve of the duodenum. It is about 12 inches long and tapers from right to left. (Remember, anatomically speaking, left and right are referenced from behind the body so they are actually reversed in most diagrams that view the body from the front.) The thick part, the head, comprises almost 50% of the mass of the pancreas and lies to the right, nestled in the C-curve of the duodenum. As for the body of the pancreas, it moves up and to the left, tapering into what is known as the tail of the pancreas, which terminates at the junction of the spleen. As might be suspected for such an important organ, the pancreas is richly supplied with arteries and veins. It is served by branches from the hepatic artery, the gastroduodenal artery, the pancreaticoduodenal artery, the superior mesenteric artery, and the splenic artery. Ninety-nine percent of the pancreas is made of acini, clusters of cells that resemble a many-lobed "berry" (acinus is Latin for berry). The acini produce exocrine digestive juices that flow out of the acini through small ducts that eventually join together and feed into the duodenum through the pancreatic duct. But today, we are not interested in that ninety-nine percent. We are interested in the one percent of the pancreas that is made up of several million cells scattered throughout the pancreas, grouped together in globules known as islets of Langerhans. It is these cells that contain the endocrine functioning of the pancreas. A healthy human pancreas contains about one million such globules, which are distributed throughout the organ like tiny islets in a vast ocean of acini -- hence their name. Their combined mass is a mere 1 to 1.5 grams. A single islet of Langerhans is actually comprised of four distinct types of cells (alpha, beta, delta, and gamma), two of which are primary: alpha and beta. Alpha cells constitute 20% of the islet's cells. They secrete the hormone glucagon, a polypeptide of 29 amino acids, which raises blood sugar to maintain normal levels. For the most part, glucagon does not present the same problems as insulin and will not raise blood sugar much above normal -- 80-100 mg of sugar per 100 ccs of blood. For obvious reasons (diabetes), we don't want blood sugar to go too high. But for the brain, we don't want it to go too low either (hypoglycemia). The brain does not store sugar and has no reserves. If blood sugar falls too low, the brain is affected in minutes, possibly even seconds. Note: all of the islet cells are serviced by an abundant network of capillaries that carry their "products," including glucagon, out into the bloodstream. The production and release of glucagon in the pancreas is regulated by chemoreceptors throughout the body that constantly measure the amount of sugar in the blood. Whenever blood sugar gets too low, the chemoreceptors signal the alpha cells in the pancreas to release more glucagon. Glucagon in turn travels through the bloodstream to the liver, where it acts on hepatocytes (cells in the liver) to break down glycogen (the stored form of glucose) into glucose through a process called glycogenolysis. Also, if required, the body can convert amino acids and/or fat into intermediate metabolites that are ultimately converted into glucose through a process called gluconeogenesis. In either case, the glucose makes its way into the bloodstream where it is available to be used by cells for energy. Correspondingly, higher-than-normal blood sugar turns off the release of glucagon. It should also be noted that stimulation of the sympathetic nervous system in preparation for stress, or flight (or in response to fright) also affects glucagon release; it increases it. This is accomplished through both neural and hormonal signals coming down into the pancreas. Hormonally, we're talking about epinephrine and norepinephrine, which stimulate the release of glucagon, thus raising blood sugar levels. And finally, glucagon secretion is inhibited by amylin, a peptide of 37 amino acids, which is secreted by the beta cells of the pancreas. Injections of glucagon are sometimes given to diabetics suffering from an insulin reaction in order to speed the return of normal levels of blood sugar. All of glucagon's actions tend to counter those of insulin, which works to reduce the level of glucose in the blood. Incidentally, glucagon, like insulin, is readily available thanks to genetically engineered bacteria and recombinant DNA technology. This is done by inserting the human gene for insulin into E. coli bacteria, which then "grow" genuine, bio-identical, human insulin in culture tanks. For those squeamish about E. coli, this process is also done by some manufacturers using yeast instead of bacteria. Beta cells constitute approximately 80% of islet cells. They secrete insulin, which lowers blood sugar -- also in response to chemoreceptors. Higher-than-normal blood sugar stimulates beta cells to release insulin. 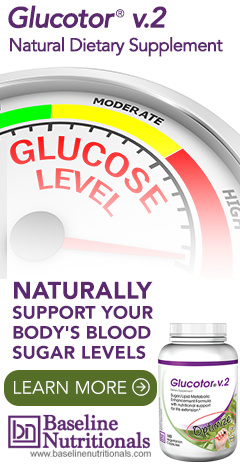 Sustained high blood sugar is bad not only for the blood but also for organs and cells. Beta cells have channels in their plasma membrane that serve as glucose detectors. Beta cells secrete insulin in response to a rising level of circulating glucose (i.e. "blood sugar"). Insulin is a small protein that affects virtually every single cell in the body and most organs -- primarily by regulating how every cell in the body utilizes glucose. Seventy-five percent of that glucose is ultimately used by the body to sustain brain function. The remaining 25% is divided between muscle function, red blood cell production, and powering every single cell in the body. Actually, glucose does not power those cells directly, but rather, through a process known as glycolysis, it is used in the creation of pyruvate, which is then turned into adenosine triphosphate (ATP), the actual energy source within the cell. Again, insulin is a primary regulator of sugar in the body. For example, it stimulates skeletal muscle fibers to take up glucose and convert it into glycogen, which is the storage form of glucose and is utilized in muscle tissue to produce ATP by the muscle itself. Insulin also works inside muscle tissue to extract amino acids from the blood and stimulate their conversion into protein, thereby causing the muscles to "grow." Insulin also acts on liver cells, stimulating them to take up glucose from the blood and convert it into glycogen while inhibiting production of the enzymes involved in breaking glycogen back down into glucose and inhibiting the conversion of fats and proteins into glucose. In this way, insulin helps regulate the body's energy storage system. It should be noted that when the dietary intake of high glycemic carbohydrates is excessive, this leads to an excess of stored fat in the liver, which ultimately compromises liver function. This is further compounded by the fact that insulin acts on fat cells to stimulate their uptake of glucose and the synthesis of fat. In each case, insulin triggers these effects by binding to the insulin receptor -- a transmembrane protein embedded in the plasma membrane of the responding cells. Increase the speed and ability of glucose to diffuse into cells -- especially the skeletal muscles and heart muscles for the restoration and recovery of those muscles. Accelerate the conversion of glucose into its storage form, glycogen. Increase the synthesis of proteins from amino acids. Increase the synthesis of fatty acids -- especially in the liver. This is the mechanism animals in the wild use to store energy for hibernation or just to survive harsh winters. Unfortunately, it causes problems for modern man as we no longer face such extreme conditions -- thus leading to an excess of fat storage. It decreases the rate of glycogenolysis (breakdown of glycogen into glucose) and gluconeogenesis (conversion of fats and proteins into glucose). The net effect is to lower glucose levels. Lower-than-normal blood glucose turns off the output of insulin. But there are other factors that also affect insulin release. The parasympathetic nervous system can stimulate insulin release to aid in recovery and rest. Glucagon itself causes insulin release to balance its effect in a negative feedback loop. And finally, gastric inhibitory peptide (GIP) from the enteroendocrine cells of the small intestine responds to glucose in the lumen of the gut, thereby signaling the "preparatory" release of glucose-dependent insulin from pancreatic beta cells. It should be noted that the effect of GIP on the pancreas is diminished by Type 2 diabetes. And finally, beta cells also produce insulin-like growth factors (specifically, IGF-2), which is found in many body tissues at concentrations far higher than insulin itself. It shares the molecular structure and shape of insulin and is involved in growth. As a side note, IGF-1 (produced in the liver) and IGF-2 are used by cancer cells to stimulate growth. Delta cells constitute less than 1% of pancreatic islets. They secrete somatostatin, the same growth-hormone-inhibiting hormone secreted by the hypothalamus. This hormone inhibits insulin release and slows absorption of nutrients from the GI tract. Gamma cells also constitute less than 1% of pancreatic islets. They secrete a pancreatic polypeptide that inhibits the release of somatostatin. In other words, Delta cells and Gamma cells work to regulate each other. Diabetes mellitus is actually not one disease, but a group of disorders in which glucose levels are elevated in the blood. It is called a protean (widespread) disease because it affects every system in the body. (For more on this concept, check out Diabetes -- The Echo Effect -- highly recommended.) By itself, it ranks somewhere between fourth and sixth as a leading cause of death in the US -- and climbing the charts throughout the rest of the world. But when considered as a major factor in cardiovascular disease and kidney failure, its true impact is probably much higher. Its name, sweet urine, comes from the fact that it was originally diagnosed by tasting (not testing) the patient's urine. The word "mellitus" is Latin for honey-sweet. Elevated glucose levels make the urine sweet. Back then, doctors truly earned their fees. Polyuria: copious amounts of urine. Polydipsia: excessive thirst and drinking of water -- caused by the polyuria. Polyphagia: excessive eating. Patients with diabetes are actually starving because they're not getting sugar into their cells where it is needed -- so they are driven to eat excessively, in an attempt to compensate. There are two main types of diabetes. Type I is insulin-dependent diabetes mellitus and Type II is non-insulin-dependent diabetes, formerly known as maturity-onset or adult onset diabetes. There is also a third, less common, type of diabetes that results from mutant genes inherited from one or both parents. We will discuss all three types. Type I represents about 10-20% of all diabetes cases. It is suspected that it is an autoimmune disease in which the body becomes allergic to its own beta cells and destroys them. What triggers this attack is still unknown, although a prior viral infection may be the culprit. In any case, the net result is that there are simply too few beta cells left to make enough insulin to fulfill the body's needs, and the patient ends up with an absolute deficiency in the quantity of insulin available. Type I diabetes is also known as juvenile-onset diabetes because it often appears in childhood. Standard "medical" treatment is daily insulin injections to give patients the insulin their bodies are not providing. Unfortunately, because insulin demands fluctuate so frequently during the day, it is very hard to regulate "external" insulin in a way that keeps sugar and insulin levels consistently balanced in the body. For example, injections after vigorous exercise or long after a meal may drive the blood sugar level down to a dangerously low value causing an insulin reaction. The patient becomes irritable, fatigued, and may lose consciousness. In response, doctors have developed experimental treatments such as inhalable insulin, pancreatic transplants, islet cell transplants, immune suppression, and insulin pumps. To this point, none of these alternatives is without significant problems. On the other hand, although it cannot be controlled with diet and exercise, there are indeed alternative options that can prove helpful. We'll talk about those a little later. There is another problem associated with Type I diabetes. Since diabetics cannot use glucose for energy effectively, their bodies shift to using fatty acids to produce cellular energy. This results in an excess of fatty acid wastes called ketones. Ketones are very, very acidic, and they cause a shift to acidity in the blood. This condition is called ketoacidosis. You can smell acetone on the breath of a diabetic suffering from ketoacidosis. Uncorrected, ketoacidosis is rapidly fatal. It's probably worth mentioning that low-carb diets work by turning dieters into "controlled" diabetics so that their bodies can shift from sugar burning to fat burning. Effectively, low-carb diets interrupt the Krebs cycle by denying the body the 100 grams of glucose it needs to prime the pump for sugar burning. As I mentioned, this process essentially turns dieters into controlled low-level diabetics and produces a mild form of ketoacidosis. As a side note, if a dieter eats protein and fat, then triggers the Krebs cycle, all excess material will be turned into fat anyway -- so ultimately, little is gained unless one chooses to remain permanently a low level diabetic. For more on low-carb diets, check out my series of newsletters on the subject, Low Carb Craziness. At one time, Type II diabetes was known as adult onset diabetes because almost all its victims tended to be over 40 years of age. But those days are long gone, and now, thanks to catastrophic dietary changes in the developed world (and with developing countries struggling to imitate us) Type II diabetes is now appearing in many children. So it has been renamed. It is now called non-insulin-dependent diabetes and accounts for some 90% of all diabetes cases. In fact, children now account for 20% of all newly-diagnosed cases of Type II diabetes and, like their adult counterparts, are usually overweight. Sadly, it is almost always a self-inflicted disease -- most often triggered by high glycemic diets and excessive weight. Fortunately, because it is self-inflicted, it is usually much milder than Type I diabetes (at least if caught in the early stages) and is much easier to control. In fact, many patients have normal insulin levels. The problem is that because the body has had to pump out so much insulin over time to combat the high glycemic foods dominating so many diets, the cells of the body have become progressively less sensitive to the action of insulin. They have, to use the common term, become insulin resistant. Although virtually every single cell in the body survives by converting glucose to energy, skeletal muscle is the major "sink" for removing excess glucose from the blood and converting it into glycogen). But in a Type II diabetic, the ability of skeletal muscle to remove glucose from the blood and convert it into glycogen may be only 20% of normal. This, again, is called insulin resistance. Fortunately, vigorous exercise increases the ability of skeletal muscle to transport glucose across its cellular membrane, thus reducing the effect of insulin resistance. Or to put it another way, people who lead sedentary lives are more likely to develop Type II diabetes. Symptoms of Type II diabetes are similar to that found in Type I and include the three polys mentioned above. For most patients -- diet, weight loss, and exercise. For some patients -- pharmaceutical drugs. For a few patients -- insulin injections. On the other hand, if patients are lax and do not control their disease early on, symptoms become more severe over time. It is as though after years of pumping out insulin in an effort to overcome the patient's insulin resistance, the beta cells become exhausted. Note: there is a close relative of Type II diabetes called gestational diabetes. It usually results from transient elevations in blood glucose during pregnancy. It causes the same problems as Type II diabetes for the fetus. A very small number of cases of diabetes result from mutant genes inherited from one or both parents. These genes can cause diabetes in several different ways. Some mutant genes prevent the body from actually manufacturing insulin. Other genes cause insulin receptor sites on cells to malfunction. Still another mutation prevents the body from manufacturing glucokinase, an enzyme essential for glycolysis, the first step in converting glucose into ATP, which energizes every single cell in the body. And yet another mutation messes up the sodium-potassium pump mechanism (used to transport large molecules into and out of cells) in the beta cells of the pancreas so that the insulin they create can never leave the cell and make its way into the bloodstream. In other words, the insulin is there, but unusable. While the symptoms of inherited diabetes usually appear in childhood or adolescence, patients with inherited diabetes differ from most children with Type 2 diabetes in that their families have a history of similar problems and they are not necessarily obese. But again, inherited diabetes represents only a small percentage of diabetic patients. Ultimately, Type I and Type II diabetics end up at the same place even though they arrive there through very different means. In Type I diabetes, you end up with high blood sugar because your body can't produce enough insulin to drive the sugar into cells where it can be used for energy production. In Type II diabetes, your body can produce more than enough insulin (at least in the beginning), but because cells become resistant to the effects of that insulin, sugar stays in the blood because it can't get transported into the cells of the body. Thus, the alternative methods for dealing with both types of diabetes are similar -- with a couple of additions for Type I diabetes to deal with the autoimmune factor. Repair beta cells in the islets of Langerhans in the pancreas to optimize insulin production reserves as opposed to forcing the cells to dramatically overproduce as with glyburide, which leads to inevitable burn out. This is a "sine qua non" for Type I diabetes and is essential if you want to prevent prolonged Type II diabetes from "burning out" the beta cells through forced overproduction of insulin. Reduce stress. Remember, adrenaline suppresses the release of insulin. Since it is strongly suspected that Type I diabetes results from an out of control immune system that attacks and destroys the beta cells in the islets of Langerhans, it is essential that you try and modulate your immune system to minimize, or even eliminate, this factor. Natural immunomodulators retrain your immune system to not overreact -- and without deadly side effects. There is steadily mounting evidence that a virus may be responsible for triggering the autoimmune response that causes Type I diabetes. If so, then you will want to use antipathogens to help reduce or eliminate that viral load. If you clicked the link to Diabetes: the Echo Effect, you know that diabetes potentially affects almost every organ in the body -- many of which, as they degrade, can exacerbate the original diabetic problem. Therefore, anyone suffering from diabetes will want to do whatever is necessary to protect those organs. And that concludes our exploration of the endocrine functions of the pancreas. In our next newsletter, we will conclude our exploration of the endocrine system by examining the adrenal glands. Wonderful article, very much useful and informative. Thank you very much. I am doing some research on heavy metal chemicals and oils, including trychlorethiline, and their effects on the parathyroid glands, thyroid, liver, gull bladder and other organs. I would really appreciate any information that you could send me. If you could also let me know of other resources to find information on this it would be greatly appreciated. I have had numerous medical conditions such as acute pancreatitus, ( eight times ). I had two parathyroid glands and part of my thyroid removed and my body stopped producing testosterone, as well as many other problems. I believe that many of my problems began with the exposure to numerous chemicals and oils while serving in the military. I am 48 years old and have been experiencing these medical conditions for more than ten years now. Any assistance you can give me will be appreciated. Did you not mean to say, "adrenaline stimulates the release of insulin" instead of suppresses? This was with your recommendation of reducing stress.